This is what I posted three years ago, when I'd just started my store. 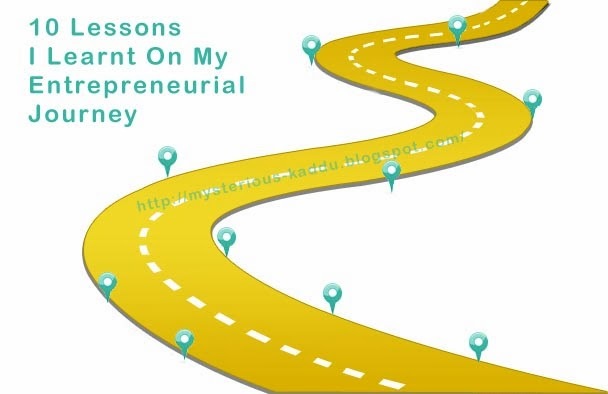 10 Lessons I learnt from starting my own business. Three years later, as I go through this list again, I realize that most of these points still hold true, while for some, let's just say "I've become wiser with age". So re-blogging this post with the changes highlighted in green. Over the course of my very new and still-very-brief 3-year-long entrepreneurial journey, I've learnt some important lessons. While most of these apply to entrepreneurship in general, a few are specific to small-scale retail business only. Journaling them here, as I'm sure I will enjoy going through them some day in the future. Every single morning, especially in winters, there WILL be a few minutes when you will ask yourself - "Why did I have to start this business when I could comfortably work from my home?" But after you spend your first summer at your store, in the sticky heat, with all the mosquitoes and various other kinds of bugs, you'll realize that winters were a piece of cake! You will soon realize that doing all the domestic chores (viz. cleaning, dishes, laundry etc.) on your own is much faster than waiting indefinitely for the maid to show up! But if you DO get a maid who comes on time and doesn't take unscheduled leaves, then there is nothing like it! Fast food, take-aways and eat-outs will no longer tempt you. On the contrary, you will crave solid home-cooked food. Especially if your body is still recuperating from serious illness. Even the tea-time biscuits will gradually lose their charm. You will realize that the retail business comes with a serious social obligation. Once you open a shop, you simply cannot take an unscheduled off any time you please. It can completely disrupt the entire day's schedule of your customer! However, you CAN change your schedule completely, if you allow for a brief transition period to inform your customers, and put up prominent notices about the change. Oh, and if you don't keep making changes repeatedly! Your work hours in the evening will stretch further and further, until you start returning home so late that all you have time left to do is to make the chapatis for dinner, eat, and sleep! In fact, very soon you will find yourself watching "excerpts" of your favorite TV show - Dance India Dance - in "news updates", during lunch break! (LOL! I'm exaggerating that bit! There are no D.I.D. updates in the news these days... it's all just politics mostly.) But, after a few months of this late-night schedule, the stress will start showing in your body and in your productivity, and you'll be forced to cut-back to a healthier work routine, even if it comes at a loss of good business. Socializing will soon be restricted to phone conversations, whatsapp interactions, and Facebook chats, and even those will be interspersed with loads of "customer-breaks"! And personal emails that were once-upon-a-time replied to within 24 hours, will now sit in your inbox for days! And even after three years, you cannot find a way to change this. Bottomline: Small-scale retail business leaves you with no social life. You will still not be able to differentiate between weekdays and weekends, as previously, each day was like a holiday, and now each day is working! Only till you realize that you are not a machine, and that you NEED at least one weekly off, even if it makes some of your customers unhappy. Dad always said that small-scale retail business is tough job, and I can see why now. There's just not enough mental stimulation. Nothing new to learn. But I think I STILL quite enjoy it... at least most of the time. Perhaps that's because I'm not just selling products, I'm also doing creative stuff here. I have plenty of working space, good lighting, well-organized storage space, all the craft material and other resources I might need. AND... MOST IMPORTANTLY... I get to step out of my house and interact with some humans every day! Especially kids. Another reason could be That's probably the main reason for me sticking with my shop for so long. The fact that most of my customers are children, and it's usually a delight interacting with kids. (Read this if you haven't already: When Kids go Shopping... Alone!) Their simple innocence gives you an entirely different perspective on life, doesn't it? You realize that life is not as complex as adults make it out to be. For over two decades, I've had this fuzzy memory of mom making an egg recipe that required milk and stuck a lot to the cooking utensil. As far as I remembered, she used to call it 'scrambled eggs'. But when I grew up and learnt how to make scrambled eggs, I found out that people here (i.e. in India) made it with chopped onions and tomatoes, and called it 'bhurji' in Hindi. That egg bhurji looked nothing like what my mom used to make. It looked like pieces of hard-set curd, tossed with onions and tomatoes, whereas the one that my mom used to make was soft and creamy, like custard. We had them on toast, seasoned with salt and pepper. And while the Indian egg bhurji is also quite tasty, I never stopped wondering about how mom made those creamy scrambled eggs (if at all they really were called that). In December last year, I finally decided to google it. I must have gone through at least two dozen recipes for scrambled eggs, both on youtube, as well as on recipe blogs, but they were all the bhurji style recipes. Even non-Indian recipes, on youtube, yielded that curd-like texture, instead of that creamy texture I remembered from my childhood days. Finally, I landed on the video of Gordon Ramsay's scrambled eggs. And it was perfect! Just what I'd been looking for! 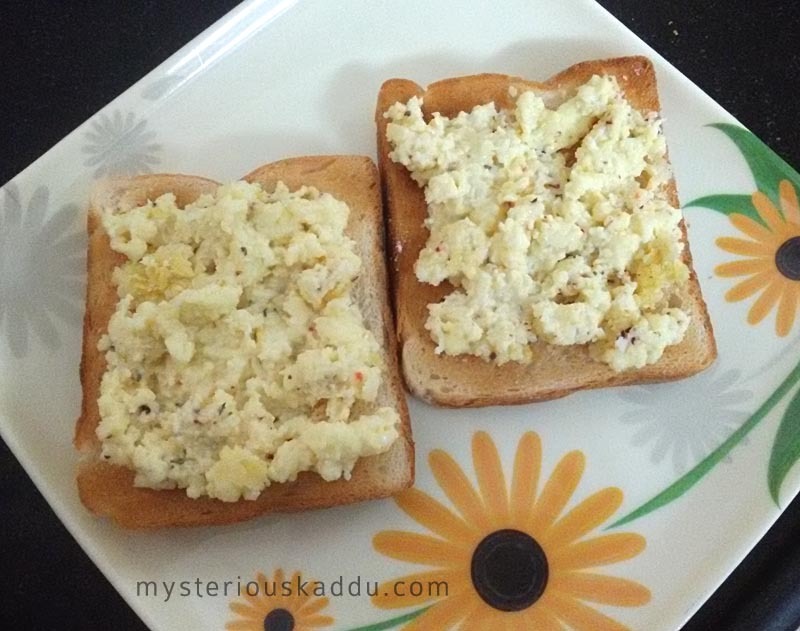 The perfectly creamy scrambled eggs from my childhood memories! I made this (for the very first time!) in December first week, when my sister was here. And, on a scale of 10, I gave it a 9 for softness. It dries even after you take it off the heat. So by the time I got it on the toast and took this picture, it wasn't as melt-in-your-mouth soft as it looked in the pan. Oh! But it was definitely that same assault on the senses that had been preserved in my cellular memory even after 20 years! Of course, I've made it many more times since December. I just take it off the heat a little earlier, and it comes out perfect now. I've embedded Gordon Ramsay's video at the end of this post. He uses cream in the recipe, but I don't have cream in the house normally. So I used milk instead (like my mom did). Here's how I made it. 1. Break the eggs into a heavy-bottom pan. I used a shallow non-stick pan the first time, which made the mixing very difficult. Best to use a saucepan or wok/kadhai. 2. Add a little butter. Then put to heat. Medium heat worked best for me. 3. Keep whisking. As Gordon says in the video, you have to really work at it. 4. If it starts to get too hot, just take it off the heat (as he does in the video) and keep whisking. 5. When it's almost done, add the milk/cream while it's off the heat. Mix well. 6. You'll know that it's done when it starts looking creamy like custard. 7. Spread on toast. Sprinkle salt and whatever seasoning you like. Sorry, I haven't got any intermediate pictures. I was, well... "working at it", as Gordon says! So couldn't click any intermediate pics. Oh by the way, one time, I also added grated cheese after the milk. It tasted even more sinful and heavenly! Sighhh! I wish I had the metabolism to take in those kind of calories on a regular basis! Well, here's the video then... for Gordon Ramsay's scrambled eggs. DO watch it before you attempt this recipe for the first time. Attempting #100HappyDays for the first time. Today was Day 5.